Extra Life Game Day: NOW LIVE! This upcoming Saturday streamers and gamers all over the states (and some other parts of the world) are uniting to raise money to benefit children’s hospitals as part of Extra Life’s Game Day initiative. 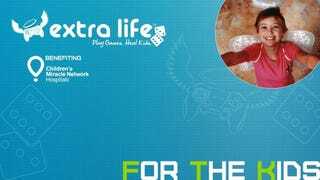 If you would like to learn more about Extra Life and the event you can visit their site here and follow them on Twitter @ExtraLife4Kids. If anyone else is joining the cause as a streamer please let us know so we can send hordes of peeps to help you remain sane. I know RerTV is also participating in the event so feel free to support him as well!